In order to increase the quality and diversity of CS-STEM students, and to help to mitigate the dearth of CS-STEM workers Carnegie Mellon University (CMU) created the CS–STEM Network (CS2N). The CS2N project is the result of 15 years of research around how people learn CS-STEM Robotics. CS2N (www.cs2n.org) uses a high-speed distribution channel and cloud-based server scaling to deliver just-in-time resources, materials, virtual competitions, and tools to thousands of formal and informal education providers across the United States (US). CS2N uses a badging system to acknowledge and motive student achievement. The badges form “mapped badged pathways” that lead to CS-STEM Robotic certifications. Students that join the CS-STEM Network have individual logins where their digital badges and certifications are stored, and teachers can create classrooms where they can track student progress via automated assessment technologies built into the system. CS2N has awarded over 648,000 badges to students over the last three years and over 4,000 CS-STEM Robotics students and teachers completed the certification process. CS2N started at CMU’s Robotics Academy (CMRA) in 2010 through a collaborative research grant from DARPA. CS2N continues to be updated based on ongoing research on: the motivational effects of badges, engaging students in computational thinking practices, and increasing exposure to CS via robotics classrooms and competitions. This new CS Accelerator Project supports the development of new badge pathways that lead to students taking the Intro to Computer Science course from the highly reputed CMU School of Computer Science (SCS). New content includes: Cyber Security, Computer Science, Game Design, Engineering, and the CMU SCS Introduction to CS 4 credit college-level course. Figure 1 – CS2N Overview. Students log into CS2N, when they register they identify themselves as a student or teacher. Students participate in research-based CMU developed CS-STEM activities where they are supported as they learn by doing. Students that complete the activities (authentic assessment) take the certification exam (knowledge assessment) that accompanies each activity. Teachers that pass the teacher certification exam can offer a certification course at their school. 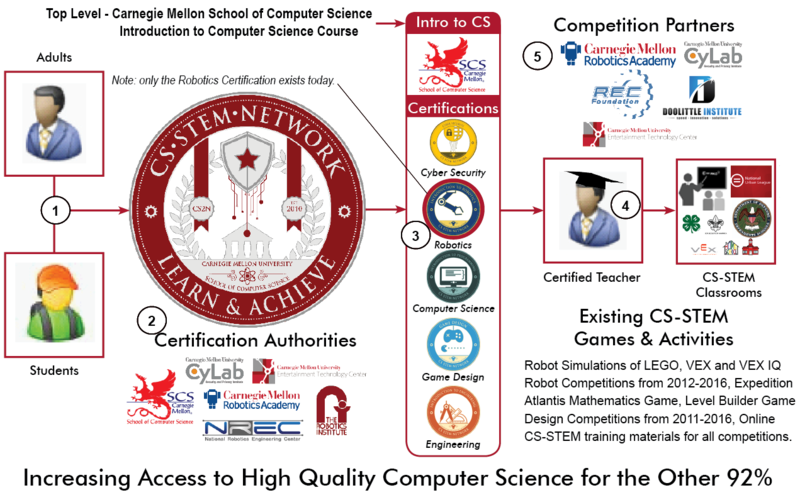 The CS-STEM Network's mission is to train and certify middle and high school students studying Computer Science and Robotics to ensure that they have the requisite skills needed to compete in today’s evolving Computer Science – Science, Technology, Engineering, and Mathematics (CS-STEM) driven economy. As part of that mission, Carnegie Mellon trains and certifies teachers on the pedagogy of teaching Computer Science, Computational Thinking Practices, and STEM in their STEM Robotics courses. Below you will learn about the partners that the Robotics Academy has worked with to develop a comprehensive CS-STEM Robotics curriculum continuum as well as the related assessment tools that we’ve developed. Additionally, you will learn about how Carnegie Mellon’s Robotics Academy became a certifying authority for middle and high school CS-STEM Robotics content. Carnegie Mellon’s Robotics Academy (CMRA) was started in spring of 2000 at the National Robotics Engineering Center (NREC) which is part of Carnegie Mellon’s Robotics Institute. At the time, NREC had a NASA project and NASA had the requirement that a percentage of a NASA funded project needed to go to education. John Bares, the director of NREC at the time, decided to use NASA funding to conduct a robotics camp for kids. Bares hired Robin Shoop, a local teacher that entered his students into robotics competitions to run the camp. After the camp, Bares asked Shoop to write a couple of unsolicited proposals to start a Carnegie Mellon outreach that used robotics to motivate learning. Shoop wrote several proposals, together they decided on the name Carnegie Mellon’s Robotics Academy, put together a website, and then began posting resources for teachers involved in robotics competitions like FIRST and BotBall. In the first year CMRA received seed funding from AT&T, the ALCOA Foundation, the Heinz Endowments, and the Grable Foundation that enabled Shoop to hire several staff members; that is how CMRA started. The mission of CMRA was to “Use the motivational effects of robotics to excite students about STEM”. In the fall of 2000 CMRA became a FIRST LEGO League Tournament Partner, it also supported local high school FIRST Robotics and BotBall teams and helped host several robotics competitions at Carnegie Mellon. CMRA staff, with the help of CMU faculty, began developing educational resources for teachers that wanted to design, build, and program competition robots and posted the lessons online for free. The Robotics Academy website quickly became a place where teachers were able to find classroom tested resources that they could use with their robotics teams. In 2002, CMRA was approached by LEGO Education North America to develop curriculum and soon after that, other commercial entities like Radio Shack, Valiant Technology, National Instruments, and Innovation First, as well as non-for profit informal education providers like FIRST, the Girl and Boy Scouts, the YWCA and YMCA, and 4H to develop robotics activities for their respective needs. Robomatter Inc., a CMU inspired company, was formed in 2003 to work with the commercial partners to commercialize CMRA developed curriculum. Income from LEGO and VEX sales provided the resources for CMRA to develop a curriculum continuum that spanned 4th through 10th grade and included introductory through intermediate level robot programming curricula for the LEGO, VEX, and Arduino robot hardware platforms. The training materials taught students how to program LEGO’s ROBOLAB™, LEGO NXT-Graphical, LEGO EV3-Graphical, ROBOTC, ROBOTC Graphical, and LabVIEW programming languages. The curriculum continuum included lessons on introductory through intermediate level programming, robot math, robot science and data logging, and introductory through intermediate level engineering. CMRA also develop camps for the Girl Scouts, helped with the development of a 4H curriculum and the Boy Scout Merit Badge, and hosted numerous robotics teacher conferences. In 2004, CMRA switched from student camps to teacher camps. All of this initial activity happened within a six year window. Note: Currently, CMRA trains and certifies over 120 teachers in one-week camps during the summer and another 200 teachers per year via online courses. Teachers are not required to take the certification test, which is required to earn the certification, but the majority of them take the test. CMRA and LRDC are currently measuring the effectiveness of robotics to teach CS-STEM as well as the motivational effects of badges and certifications. These partnerships lead to the development of the Computer Science Student Network (CS2N), Robot Virtual Worlds, a multi-year partnership with Carnegie Mellon’s Alice Team, the automated assessment tools build into the CS-STEM Network, the Expedition Atlantis and Atlantis Prime games, the programmable Level Builder, tools to teach multi-robot communications and programming for educational robots, and CMRA’s initial work around badges and certifications. In 2012, CMRA became part of the Digital Media Learning (DML) Community and won a MacArthur Foundation Grant. CMRA’s contribution to the Badges for Lifelong Learning Initiative was the Computer Science Student Network Badge System which is now part of the automated assessment built into the CS-STEM Network. CMRA and the University of Pittsburgh developed a badge system that includes a mapped badged pathway that leads to multiple CS-STEM Robotics Certifications and includes both CS-STEM Robotics courses and Computer Science specific courses. Once the system was complete, the team applied for research funding from the National Science Foundation to study the system, that grant is NSF CNS 1339354, Building a Theory of Badges for Computer Science Education. In 2014, CMRA and LRDC won another collaborative research grant named Changing Culture in Robotics Classrooms (NSF DRK-12 1418199). The focus of that research is to develop tools and resources designed to foreground computer science and computational thinking practices via robotics. Since 2000 CMRA has hosted robotic competitions, provided training, hosted conferences, and conducted research on how to use robotics as an organizer to teach CS-STEM. Below are the partners that CMRA has worked with on CS-STEM Robotics activities, curriculum development, and evaluation. Over the last 13 years, CMRA has conducted rigorous research on the pedagogy of using robotics to teach CS-STEM in classrooms. The Engineering Directorate of the National Science Foundation (NSF) funded Pittsburgh’s What is Engineering? “Research Experience for Teachers” (RET) project. NSF’s goal with the RET program is to form collaborative partnerships between K-12 STEM teachers and university faculty and students to bring knowledge of engineering or computer and information science and engineering as well as technological innovation to pre-college classrooms. The goal of these partnerships is to enable K-12 STEM teachers to translate their research experiences and new knowledge gained in university settings into their classroom activities. Pittsburgh’s RET recruited 15 teachers per year over three years who spent five weeks each summer exploring/researching robotic applications here at the National Robotics Engineering Center (NREC). The teachers worked with Robotics Academy staff to translate what they learned at NREC into classroom lessons that were then tested in their classrooms. CMRA staff observed the classroom implementations and made modifications based on what they observed. Many of the lessons learned in the RET were translated into lessons that are used in CMRA developed curriculum. Note: Carnegie Mellon’s Robotics Institute (RI) was started in 1979. In November of 1999 the Wall Street Journal dubbed Pittsburgh “Robo-burgh”. Today more than 60 robotics companies currently reside in Western Pennsylvania due to research at Carnegie Mellon University and the University of Pittsburgh. The Robotics Corridor Project was a Department of Defense (DoD) funded collaborative Research and Development (R&D) project between Carnegie Mellon and California University of Pennsylvania (CALU). Phase one of the project answered the question: “What type of knowledge, skills, and attributes do highly qualified technicians need to have to work in the robotics industry?” The team conducted DACUMS with technicians from over 30 industry regional partners that identified themselves as either robotics companies, or companies that used a large amount of automation. The DACUM facilitators asked the question: “What roles do technicians play in your company?” The DACUMs were facilitated by staff from the National Occupational Competency Testing Institute as well as college faculty. The goal of Phase one was to understand the major duties, tasks, knowledge, skills, and traits needed to work as a robotics technician. The team used the results from the DACUMs to develop an Associate Degree Program at CALU. Phase two of the project was led by CMRA and included the following partners: CMRA, California University of Pennsylvania, the University of Pittsburgh, Robert Morris University, the Community College of Allegheny County, Butler County Community College, Westmoreland County Community College, the Community College of Beaver County, local industry partners, and the National Robotics Engineering Center. Phase two was designed to share the lessons learned in phase one with additional college and industry partners. This part of the project either developed new Robotics Associate Degree Programs at regional community colleges, or validated existing associate degree programs. This phase of the project also created articulation agreements between the two year colleges and the four year colleges. The NSF funded Robotics Corridor Phase II project was collaborative R&D project between CMRA and the University of Pittsburgh’s Learning Research and Development Center (LRDC). The project’s goal was to design an articulated set of STEM Robotic lessons from the elementary school level through high school that prepared students to pursue advanced STEM degrees. The project (along with CMRA funding from teacher training and sales of curriculum) funded curriculum development, curriculum testing in classrooms, numerous robotics educator’s conferences, and K-12 teacher training. Additionally, one of the projects goals was to develop articulation agreements between local high schools and the Western Pennsylvania colleges that offered STEM Robotics, Computer Science, and Engineering degrees. The project provided CMRA with the opportunity to incorporate lessons learned through the DoD funded Robotics Corridor Phase One R&D project into curricular modules that it had developed previously. CMRA and LRDC had been studying robotics ability to teach mathematical competencies since 2006 using internal CMRA funding but never had dedicated research funding. The NSF funded Robot Algebra project was a collaborative research project between Carnegie Mellon and the University of Pittsburgh’s LRDC. The goal of the Robot Algebra project was to find the most salient form of mathematics that could be taught via a school based robotics program. The project was motivated by fact that at the time there were over 10,000 schools using robotics to teach STEM concepts in their classrooms and our research findings with prior NSF Robotics Corridor Phase II couldn’t find measurable mathematics gains after students completed robotics lessons. We believed that we could develop lessons that would show an improvement in students’ mathematical competency. The project developed multiple tools designed to foreground and test students’ mathematical competency including: abstraction bridges, robotics lessons that included model eliciting activities, and several games and simulations. We’ve seen the most significant measurable gains when teachers use a very specific set of techniques when teaching with robotic that involve separating the mathematics, the robot hardware, and the robot programming. You can learn more about the Robot Algebra project here. The Computer Science Student Network which is now the CS-STEM Network. The CS-STEM Network has over 80K members that have earned over 640K badges or certifications. The CS-STEM Network sponsors annual competition in partnership with the Robotics Education and Competition Foundation, the Doolittle Foundation, and Robomatter Inc.
An automated assessment engine that teachers can use to track students’ progress when students are using Robot Virtual Worlds, the Expedition Atlantis Game, or the Atlantis Prime Game. LRDC research has confirmed that the Expedition Atlantis Game improves students’ proportional reasoning skills. The development of a robotic simulation environment that is currently being used by thousands of schools. The simulation environment, Robot Virtual Worlds (RVW), is programmable using LEGO NXT-Graphical, LEGO EV3-Graphical, LabVIEW, ROBOTC Graphical, and ROBOTC Text based programming languages. RVWs include a measurement toolkit that enables kids to develop mathematical solutions to their programming problems, a level builder and model importer that enables students to build new levels and games as well as import new models into their level, and automated assessment tools that enable a teacher to track students’ progress as they solve programming challenges. LRDC confirms that students learning to program via RVW simulations learn to program in about half the time than if they learned programming using physical robots. The DARPA project was a huge success. Tools developed by the project are being used by nearly one-million students per day and revenue from CS-STEM Network Certifications enable CMRA to continue to maintain the CS-STEM Network. This project proposed to integrate a comprehensive badging and certification system into CS2N. The partners on the project included: CMRA, the University of Pittsburgh’s LRDC, DARPA, LEGO, National Instruments, and Robomatter Inc. The project added another dimension to the DARPA/CMRA Computer Science Student Network (CS2N). CMRA proposed to develop mapped badged pathways around LEGO educational technologies. The goal of the project was to establish concrete curricular trajectories from introductory-level tutorials to industry-recognized certifications. The project included both student and instructor level badges designed to certifying pedagogical proficiency. When a teacher was certified, then they would receive limited administrative rights enabling them to setup their own badged courses. The Building a Theory of Badges for Computer Science builds on and studies the DARPA and DML R&D projects. In those projects CMRA and LRDC developed mapped badged pathways that lead to CS-STEM certifications. The team builds on the current success of robotics competition’s ability to attract a broader set of learners, and seeks to deepen their understanding and interest in CS. Badges have recently attracted a great deal of attention as a tool to motivate students and mark significant learning accomplishments. The badge’s dual role as both motivator and assessment marker raises interesting questions about the ability of existing theories of Motivation and theories of Assessment to fully predict, explain, and guide the design of badges for student motivation AND assessment. Design: Which particular badges: Are perceived as desirable, easily understood by students, and are accurate indicators of performance? Research: Does our Badge Theory predict associations of particular Badges with particular motivational states? Research: Does our Badge Theory predict Pathways of motivational variables to larger outcomes (skills and career goals)? Evaluation: Does the overall badge ecosystem increase: learner persistence, CS content learning, and CS career interest? Relatively little is known about the progression of programming and computational thinking skills that students do or do not learn in robotics classrooms. The project works very closely with the established robotics competition community and extends the CS learning opportunities after the competition season is finished. This project is a DRK-12 Full Design and Development Proposal that addresses each of the four DRK-12 research and development strands. The project focuses on developing innovative curriculum that places students from grades 5 through 12 into activities that promote computational thinking practices as it teaches creativity, abstraction, algorithms, and programming; four Big Ideas of Computer Science identified in a number of national policy documents. The project builds on CMRA’s broad reach into the robotics education community, LRDC’s years of experience with the construction and evaluation of Design Based Leaning units, and a combination of research-based tools developed during a ten year CMRA/LRDC partnership where we have studied how teachers implement robotics education in their classrooms and developed curriculum designed to foreground specific principles leading to significant learning gains. This full design and development proposal designs a set of scalable Model Eliciting Activities-based units and trains teachers how to use them, empowering them to create a broad and diverse pool of students who are well prepared and motivated to take advanced CS courses and compete in our CS driven economy. What kinds of resources are useful for motivating and preparing teachers/students to teach/learn computational thinking practices through robotics education? What do robotics teachers struggle with the most when teaching CS principles and practices and what kinds of supports are needed to guarantee integration of CS principles and practices into their classes? Can virtual environments be used to significantly increase access to CS? And if yes, what level of computational thinking and practices can be taught and how can this be advanced?